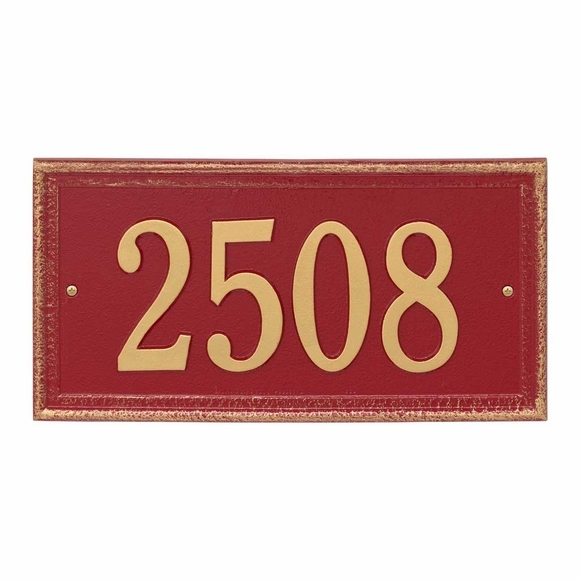 House Number Plaque with Rubbed Border - - includes eye-catching bold numbers. Make a fresh style statement with an unexpected color combination such as red/gold or go sophisticated with something more subtle (antique brass or antique copper). Made in USA. Traditional wall mount rectangle plaque framed by an antiqued-style border that repeats the house number color. Holds up to four (4) 4" numbers. Character count includes spaces and punctuation. Large image Color: RG red with gold characters. Smaller images (from left to right): antique brass, antique copper, black/gold, black/silver, black/white, green/gold, oil rubbed bronze, pewter/silver, red/gold. Dimensions: 15.7"W x 8"H x .375". Traditional address plaque adds instant curb appeal to your home. Proudly hand crafted in the USA.